Default constructor provides background estimation with scalar pt sum. Constructor to provide background estimation based on . 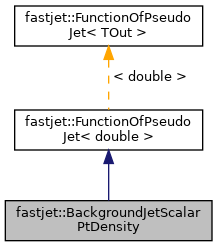 Class that implements (scalar pt sum of jet)/(scalar area of jet) for background estimation (this is a preliminary class). Optionally it can return a quantity based on the sum of pt^n, e.g. for use in subtracting fragementation function moments. Definition at line 483 of file JetMedianBackgroundEstimator.hh. Definition at line 41 of file JetMedianBackgroundEstimator.cc.